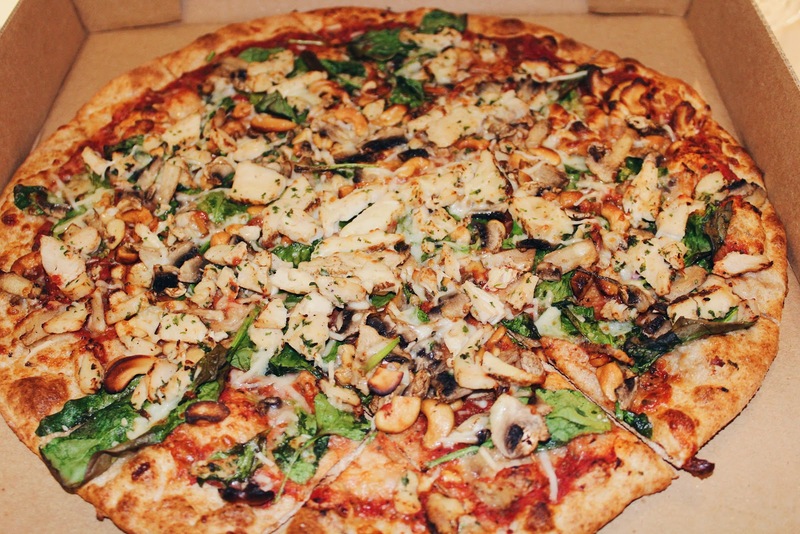 The end of February means it's time for another monthly favorites post! February may have been a short month, but it was a pretty good one and I found a few of items that I loved. 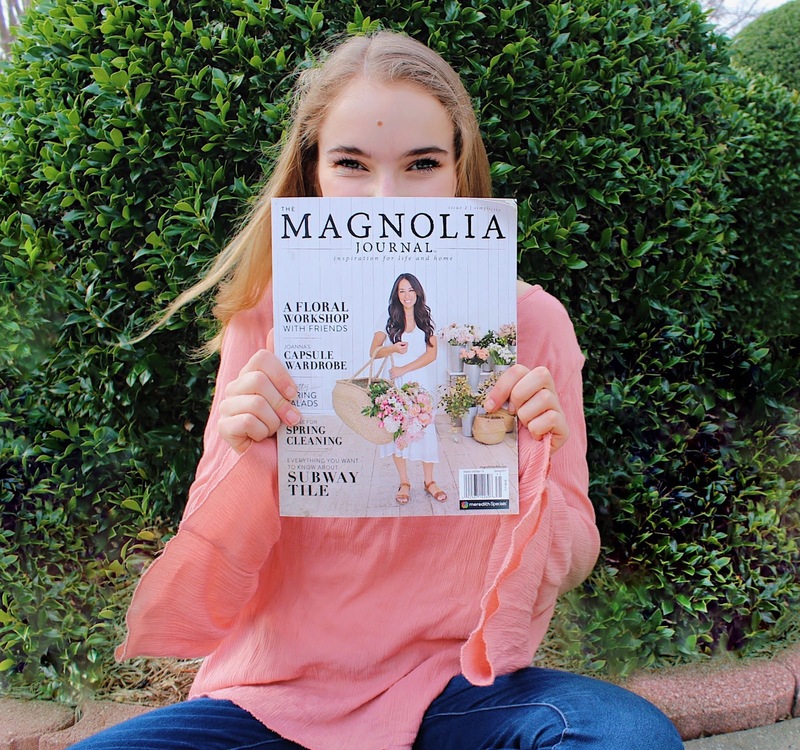 The Magnolia Journal // Last year, when I heard about the magazine that Chip and Joanna from Fixer Upper were releasing, I wanted a subscription right away. The first edition was delivered in mid-February, and I read it cover to cover. Not only are the stories interesting, but each page is designed so beautifully. Ever since joining my school's yearbook staff, I've had a greater appreciation for the design and layout of magazines, and every page on this one was absolutely perfect. I'm already looking forward to the release of the next edition! Clinique + Crayola Lip Stick // My grandma gave this to me for Valentine's Day and I've been wearing it every day since! My old lipstick from Tarte recently melted (not quite sure how that happened) so I'd been looking for a new lipstick but I hadn't gotten around to buying one yet. I love this one because it's not too pigmented, but it adds a nice pink tint while keeping your lips moisturized. The Office // Lately, I've been obsessed with The Office! It's such a hilarious show, and I may or may not have watched an entire season over the course of one weekend (whoops). If you haven't seen it yet, go watch it - I promise, you'll be hooked as soon as you get past the first season (it's pretty slow). Brown Lace-Up Sandals // I finally hopped on the lace-up shoes trend! When I saw these shoes at TJ Maxx, I knew right away they would be a staple in my closet during the upcoming months. I was looking for a new pair of brown sandals, and these will go perfectly with a lot of my spring and summer clothes. Plus, they were only $20 - such a good deal! I also got quite a few short sleeved tops that will be perfect for spring! If you want to see them, you can check out my latest YouTube video here. I will probably be featuring a lot of these tops in upcoming blog posts, so be on the lookout for that! What products have you been loving this month? Let me know by leaving a comment! Happy Friday! This week wasn't all that bad, thanks to the fact that I had a three day weekend last week. The extra day this weekend had me really excited for spring break - I'm not disclosing my destination just yet, but I've been doing a lot of research and planning and I have a feeling it's going to be such a fun trip. Expect some spring break oriented blog posts coming to you soon! 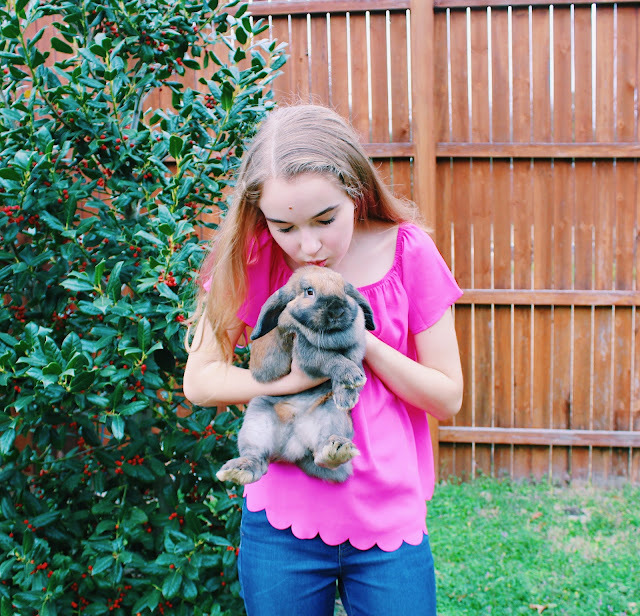 Valentine's Day // This year, Valentine's Day was extra special because it was also my bunny's first birthday! 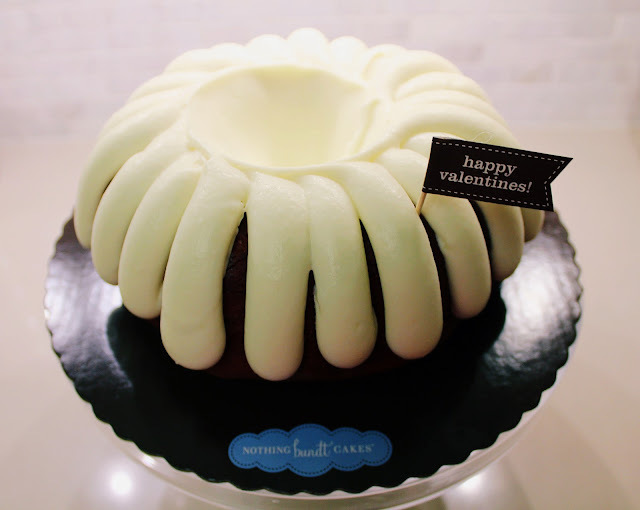 We had Palio's pizza and Nothing Bundt Cakes (my favorite!) and it was a fun night overall. Cocoa definitely didn't know why she was receiving so much attention, but we certainly did and we are so thankful to have such a sweet bunny. Teeth // I've never really talked about my teeth on here, but the truth is, they're pretty messed up. The two teeth next to my front teeth never came in, because for some strange reason they don't exist, so I've always had two big gaps in my mouth ever since my baby teeth fell out. Last week, I finally got two fake teeth put in my mouth where my real teeth are supposed to be. It definitely felt weird at first, but I've gotten used to them now and I love them! You can kind of tell the difference in this picture here. Also, side note - I'm so excited to be a Jadelynn Brooke rep for another semester - I'm wearing my rep shirt in the above picture! You can continue to use my code BBHS16 for 15% off your purchases there. YouTube // I finally did something I've been wanting to do for a while now - I started a YouTube channel! This has been on my 101 in 1001 list for over a year now, and when I received my DSLR camera for Christmas I knew that I would soon create a YouTube channel. I finally got around to doing it recently, and uploaded my first video last Saturday! You can check it out here! I hope y'all had a great week! I don't know why, but I've been seeing so many adorable spring clothes lately! I always love spring fashion, but I feel like companies have come out with some particularly amazing clothes this year. I've been eagerly awaiting warmer weather, and I'm really hoping it's right around the corner so I can wear some of these clothes! These items are all on my wishlist for a reason - a lot of them aren't very practical. For example, I need another Lilly Pulitzer dress like I need a hole in the head, but I fell in love with this print the moment I saw it. The only other thing it comes in is a crop top and short set, which is a little outside my comfort zone. (I do plan on trying it on, though, before I rule it out completely!) These gingham sneakers are another example - while they're adorable, I don't think I own anything that they would go with! Although, now that I think about it, they would look adorable paired with this white shirt (anything with bows on the back is instantly in my shopping cart) and this tassel necklace (I've been wanting one for a while but have yet to find one I like). I've been on the hunt for a good Easter dress, and while this one didn't fit in the shoulders when I tried it on at Francesca's, I still really like it so I'm keeping it on my wishlist, haha. I also randomly came across this floral off the shoulder dress when I was looking online at Nordstrom, and I think it would be the perfect dress for warmer weather! I'm not sure how I feel about off the shoulder clothes, though - I only have one off the shoulder top, and if I'm completely honest, I wear it on the shoulder like I did in this post. I've been looking for a new swimsuit ever since I left my favorite one at the hotel in Palm Beach last summer (along with my favorite earrings in the Lilly Pulitzer dressing room - don't ask) and I love the cutouts on this one! I also have wanted a pair of Tory Burch Millers for quite a while, although they are wayyyy out of my price range. This striped lace-up top from Old Navy would complement the sandals perfectly, too! Lastly, I have had this pink ruffle top bookmarked ever since Lauren featured it in an outfit post! It's so simple, yet fun! I think this Kate Spade watch - another item that's been on my wishlist for a while - would pair nicely with it, along with several other short sleeved shirts that I already have. 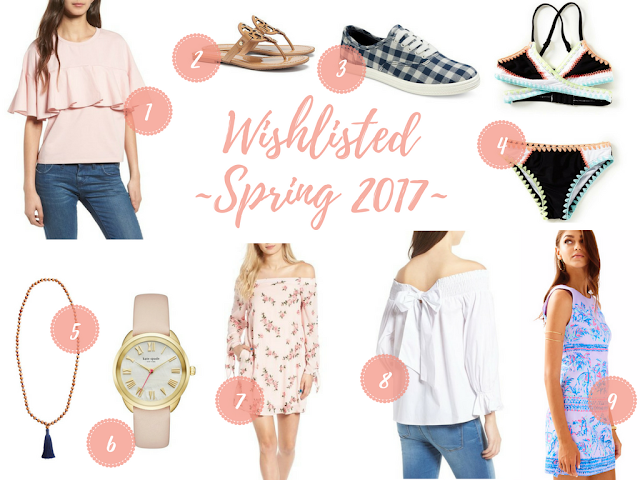 What items are on your wishlist for spring? Leave a link down below - I'd love to see them! Happy Friday! This week was a fun one, and I'm honestly kind of sad to see it come to an end. I celebrated my bunny's first birthday and Valentine's Day, so it was a great week all around! I am excited for the three day weekend we have, though - a day off from school is always appreciated. Keep scrolling to see my favorite links within the past two weeks! 1 // Valentine's Day may be over, but I'm a firm believer that you should always incorporate some pink into your wardrobe, and Jessica shows you just how to do that! 2 // I've been a fan of huge murals lately, and here are some Dallas ones that I'd love to hunt down! 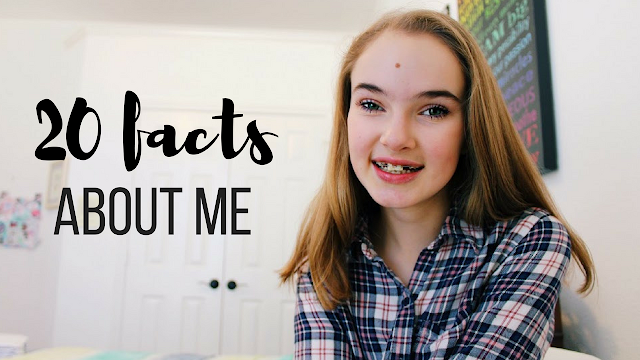 3 // Being a fashion blogger isn't necessarily what you think, so Cortney debunks some myths in this post. 4 // These GIF's of cupcakes being frosted are all you need in life right now. 5 // Kelly shared the most adorable pictures of her daughter's nursery, and I'm in awe! 6 // I really want to improve my photography skills, and I think Paulina's post on how to work a camera on manual will really help me. 7 // Have you read my post on how I style taupe ankle boots? 8 // I have been seeing so many darling spring tops with bows on them recently, and I love this one that Tristan featured on her blog. 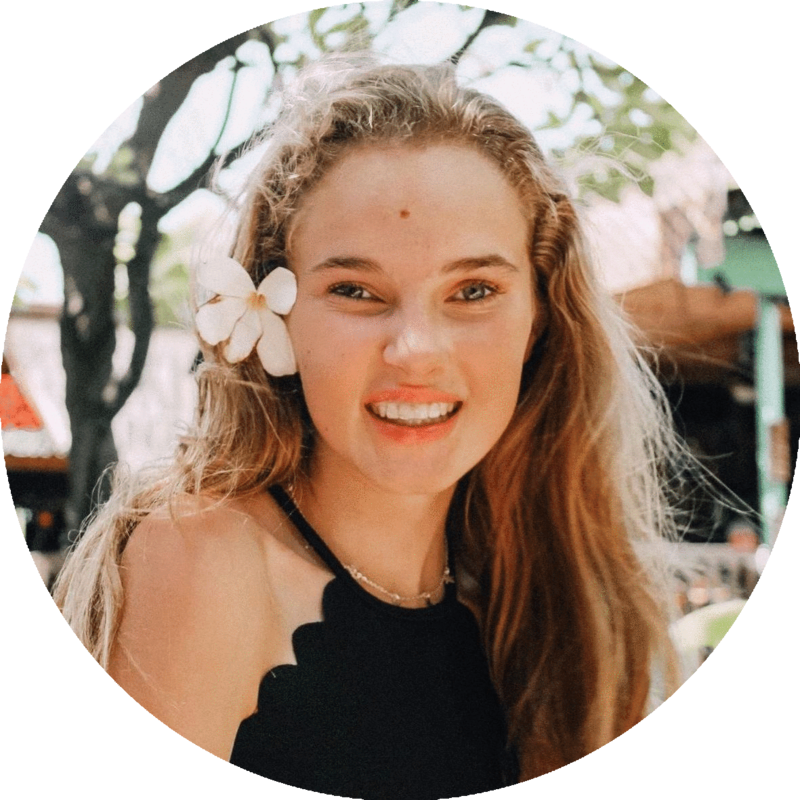 9 // Julia shared a bunch of fun, colorful swimwear that has me wishing summer would come faster! 10 // Krista shares 5 tips for an organized closet that I will definitely be utilizing! 11 // Traveling soon? Read this post on the top 15 Instagram travel hashtags! 12 // These pictures from Kiel and Sarah's trip to Austria are gorgeous! I hope you had an amazing Valentine's Day filled with love and chocolate! Have a great weekend! Ever since I got these taupe boots back in November, they've become an essential in my winter wardrobe. I wear them a lot more than I expected to, and surprisingly, they're very comfortable. At first, I wasn't really sure what to wear with them, but I searched through my closet and paired together the perfect outfits to wear with these shoes! 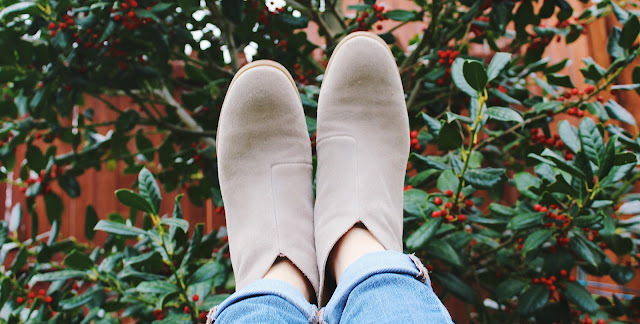 Today, Michaeala from The Shore Life According to M and I have partnered up to share two ways we like to wear our taupe ankle boots! Make sure you go check out her post when you finish reading mine! I recently discovered this purple cowl neck top when I was going through my closet, and I'm so glad I stumbled upon it! I don't own anything this color, so it really stands out upon my other winter clothes. To accessorize, I added my favorite jeans, some classic jewelry, and added my taupe boots to finish the outfit. This look is so simple, yet I love how everything comes together! 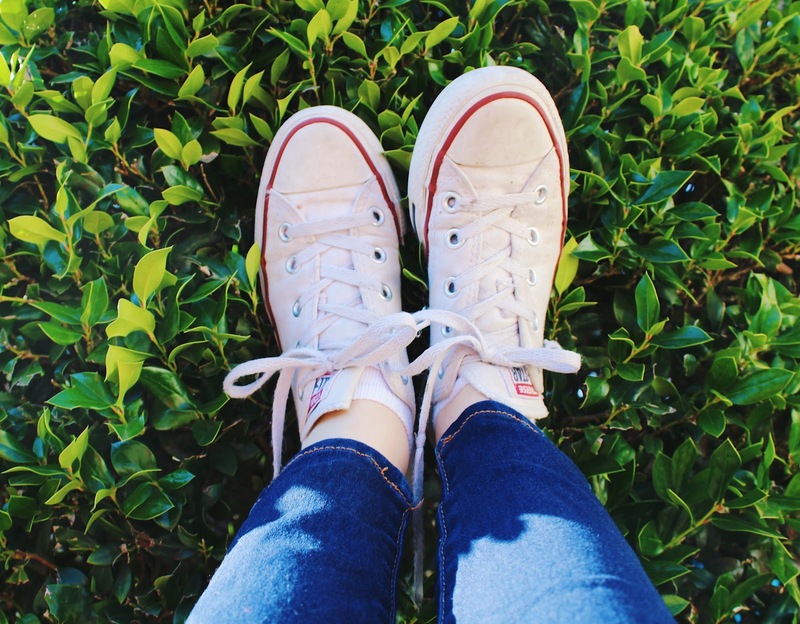 It's perfect to transition from winter to spring. I also featured these shoes in this post - I feel like taupe boots look best with a simple, solid top and some plain jewelry. I like for the shoes to really stand out and make a statement. I've linked some of my favorite taupe booties in the widget below - scroll through to see all my favorite pairs! I hope this post gave you some inspiration on how to wear taupe ankle boots, or any ankle boots in general! If you don't own a pair of taupe booties, I highly suggest investing in some. I've gotten my money's worth out of mine! The countdown is on: Valentine's Day is six days away! While it's not one of my favorite holidays, I love any excuse to dress up in pink and eat chocolate. 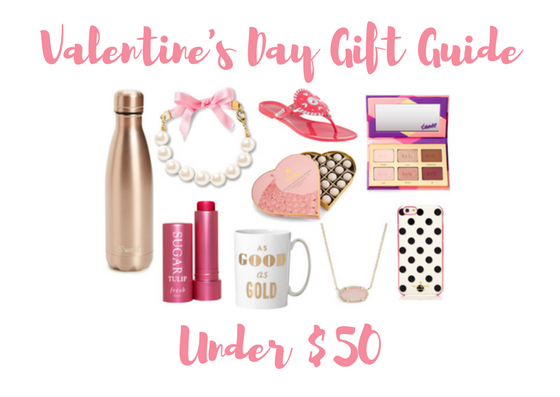 Today I've put together some gifts that are perfect for any girl, but they are all under $50 so you don't have to worry about breaking the bank. I'm a firm believer that Valentine's Day should be used to celebrate all the loved ones in your life, not just your significant other, so these gifts are perfect for moms, sisters, best friends, or even yourself if you want to buy a little treat! I've been loving the color combination of gold and pink lately, and a lot of these items follow that trend. The necklace and bracelet would look so cute together (I seriously need that bracelet) and the Jack Rogers would add such a fun pop of pink to any outfit! The Kate Spade mug would be so cute to sip coffee out of, and I love the Kate Spade phone case too. Of course, almost anything from Kate Spade would make for the perfect Valentine's Day gift. I've had my eye on this lipstick for a couple weeks now, and this makeup palette is similar to my all-time favorite palette. Also, how perfect is this Swell bottle?! I already have a pink one, but if I didn't own one this gold one would be on the top of my wish list. Lastly, I have a classic Valentine's Day gift picked out - chocolates! You can never go wrong with a box of gourmet sweets. Like I said, all of these gifts would be perfect for Valentine's Day if you have yet to pick something out for a sister or friend. I hope y'all have a great week - let me know what you're getting your loved ones for Valentine's Day! What are your go-to gifts to give for Valentine's Day? Happy Saturday! I know I typically publish these posts on Fridays, but I wrote a bonus post for y'all on Thursday and I don't like to publish posts two days in a row. This week was a long one, as I had a lot of work due and am also fighting a cold, but I have fun plans for this weekend and am remaining optimistic in hopes that next week will be better. 1 // I've heard several great things about this lipstick, but have yet to pull the trigger... have y'all tried it? Any thoughts? 3 // Krista's review of the Apple Watch has me thinking about buying one! 4 // These breakfast brownie bars look delicious and I will definitely be making them! 5 // I've been looking at so many cute tops for spring, but this one really caught my eye. 6 // Ashley and I collaborated to bring y'all some Valentine's Day outfit ideas... check out my post here and hers here! 7 // This very detailed post about blogging tips has some unique tricks that you probably haven't heard before. 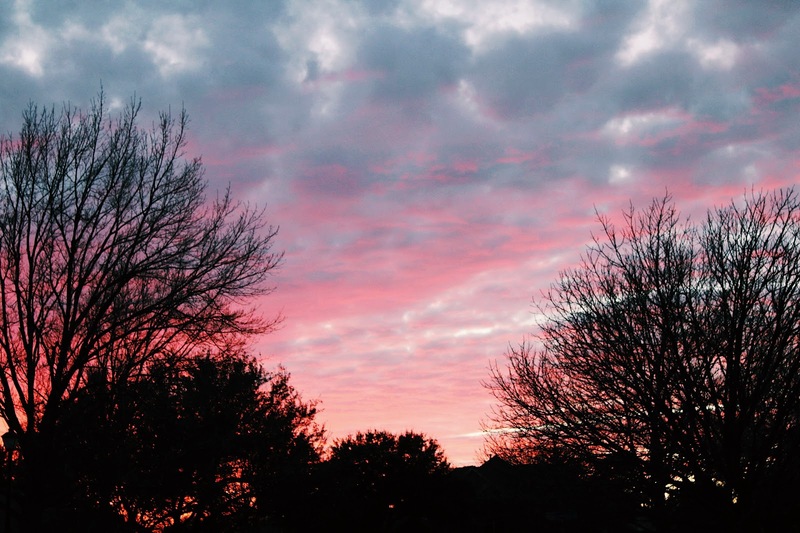 8 // The weeks following the holidays can be very gloomy - here are some ways to cheer you up! 9 // Sorority recruitment seems like such a daunting process, but Lucy broke it down bit by bit to make it easier to understand. 10 // Designer Blogs always has the cutest wallpapers, and this Valentine's Day one was too adorable not to share! 11 // I love bows, so naturally I enjoyed seeing all of Carly's top picks for items with bows. Valentine's Day is right around the corner, which means it's time to start thinking about what to wear! 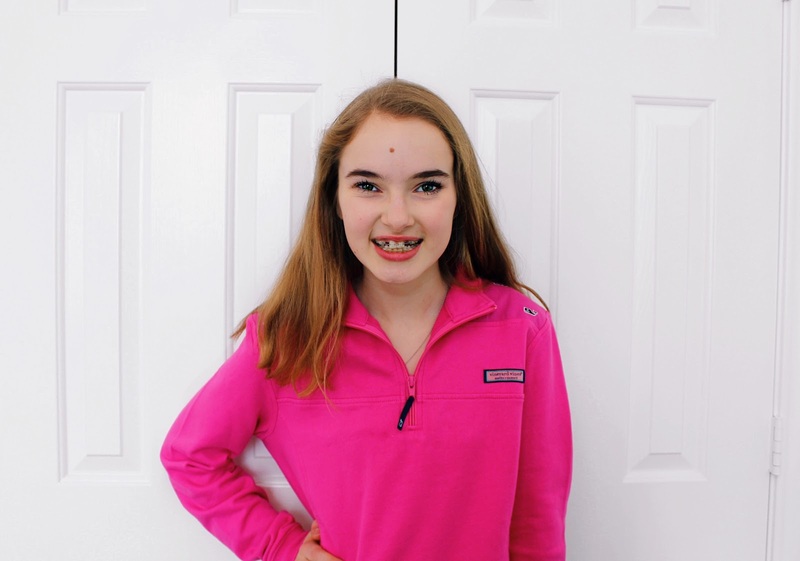 Today, Ashley Canady of Richmond Prepster and I have put together four looks that will hopefully give you some Valentine's Day outfit inspiration. Ashley is seriously so sweet and I know y'all will love her blog as much as I do! I featured this sweater in this blog post, but I had to feature it again because it's such a versatile piece and it can be worn so many different ways! 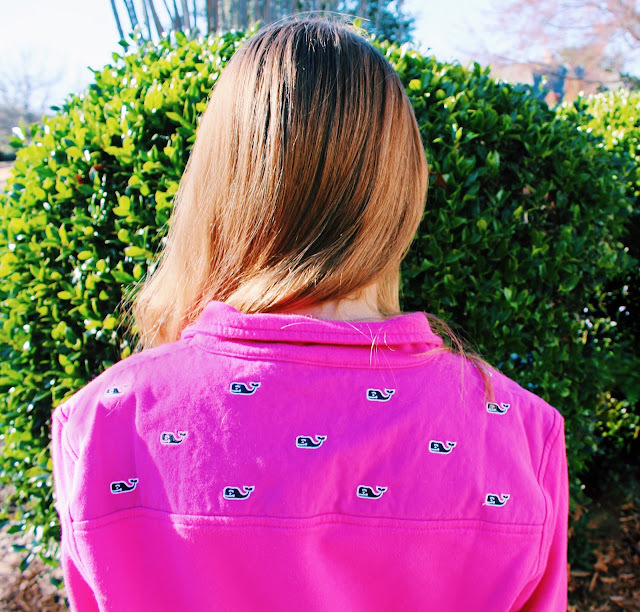 It should definitely be a staple in every girl's closet. 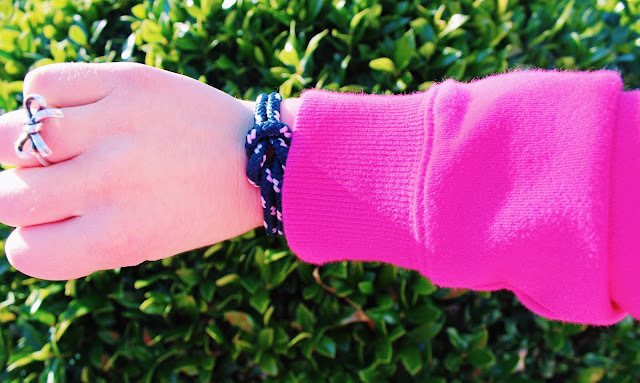 To add a pop of pink to this outfit, I paired it with my Hunter rain boots. The entire outfit is simple, yet put-together and perfect for Valentine's Day. I received this Shep Shirt for Christmas, and I knew right away I'd wear it for Valentine's Day! I don't own that many hot pink items, so this item really stands out in my closet. I have always been in love with the color combination of pink and navy, so this outfit will forever be one of my favorites. To accent the outfit, I added some of my favorite silver & navy pieces of jewelry! Ashley is sharing two more Valentine's Day outfits on her blog, so make sure you go read her post! Ashley Canady from Richmond Prepster is a 20 year old college student studying psychology at VCU. She also works as a stylist at her local J.Crew and loves how her job has opened so many doors for her in the fashion world. Her blog consists of a little bit of everything (life & style), as well as some fun collaborations and the occasional more personal blog posts. 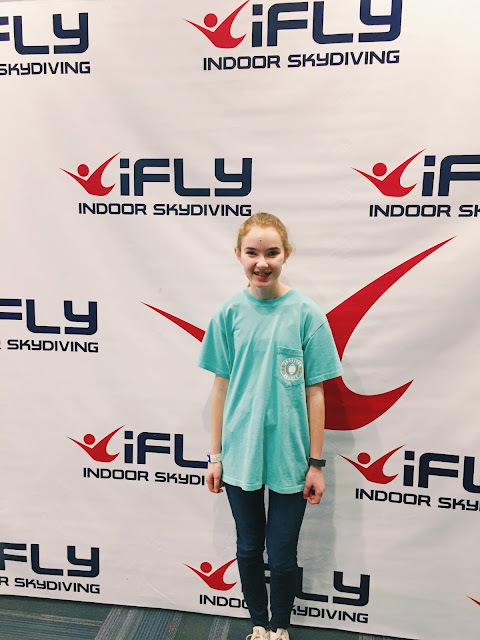 She wears way too much navy, loves getting to know those who follow her Instagram and blog posts, and is so glad she took the leap this past November and started her blog! I am so excited for Valentine's Day, and I'm sure y'all are too! Here's to an entire day of chocolate treats and the color pink! What will you be wearing for Valentine's Day? Let me know by leaving a comment!